Romanian pianist Iulia Marin has performed as a soloist in the United States, Italy, Holland, Austria, Germany, Bulgaria and Romania. Iulia is several times prize winner of national and international piano competitions: First Prize at the “W. A. Mozart” International Competition Romania 8th edition, Second Prize at the “Sofia Cosma” International Piano Competition; Silver and Bronze Medals at The World Piano Competition, Cincinnati USA; second place in the Eisenberg- Fried Concerto Competition New York; laureate of the Hannoverische Borse der Musiktalente and winner of the Piano Fischer Prize, Bergen Grand Piano Academy Prize and the Chance Festival Prize at the 2016 Klavierpodium München Competition. Iulia has performed at venues such as Weill Hall- Carnegie Hall, The Harvard Club, St Paul’s Chapel at Columbia University, Greenfield Hall (New York) and had a Recital Tour in Italy. Recent performances include the St.Martin in the Fields London, Bucharest Philharmonic Atheneum Hall, Museo Diocesano Brescia, Act City Hamamatsu Hall Japan and Arlberg 1800 Concert Hall, Austria. In 2016, Iulia performed in the 12th Niestetaler Klavierfestival Kassel and Steve Reich’s “Six Pianos” in Hannover, with the composer present. Her concerto debut took place in 2007 on Romania’s most prestigious stage: the Bucharest Athenaeum Hall. Ever since, she has performed with the "Mihail Jora" Philharmonic Orchestra, Youth Orchestra "Dinu Lipatti", "Sinfonia Bucuresti" Orchestra, the National Youth Orchestra, Vidin State Philharmonic Orchestra and Shumen State Philharmonic Orchestra under the baton of conductors Ovidiu Balan, Tiberiu Soare, Nicolae Racu, Bogdan Voda, David Marcian (Romania), Stanislav Ushev (Bulgaria), Robert Gutter (USA), William Kempster (Australia) and Roberto Salvalaio (Italy). Iulia has worked in Master Classes with Antonio Pompa-Baldi, Bernd Goetzke, Boris Petrushansky, Hiroko Nakamura and Vladimir Tropp. In 2015 she participated in the Hamamatsu Piano Academy (Japan). 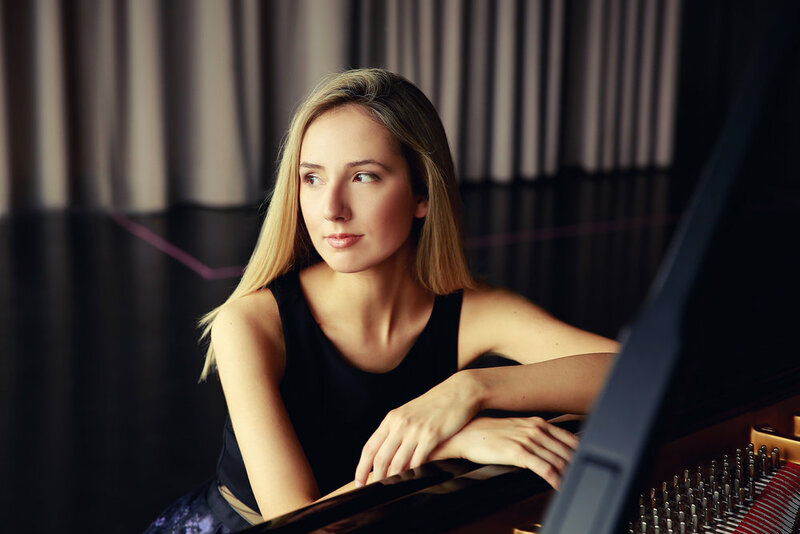 With a Music Bachelor’s Degree from the Manhattan School of Music New York, Iulia received in 2018 her Master’s Degree at Hochschule für Musik, Theater und Medien Hannover, in the class of Roland Krüger. She is a recipient of the Artur Balsam Scholarship Award in New York and the Musik braucht Freunde Scholarship Award Hannover. Die rumänisch-stämmige Pianistin Iulia Marin feierte Erfolge als Solistin in ihrer Heimat sowie in den USA, Österreich, Deutschland, Italien und Bulgarien. Ihr Debüt gab sie 2007 im Bukarester Athaeneum-Saal und wurde seitdem von verschiedenen Orchestern mit Klavierkonzerten von Beethoven, Grieg und Rachmaninov verpflichtet: "Mihail Jora" Philharmonic Orchester, Youth Orchester "Dinu Lipatti", "Sinfonia Bucuresti" Orchester, Vidin State Philharmonic Orchester und Shumen State Philharmonic Orchester mit Dirigenten wie Ovidiu Balan, Tiberiu Soare, Bogdan Voda (Rumänien), Stanislav Ushev (Bulgarien), Robert Gutter (USA), William Kempster (Australien) and Roberto Salvalaio (Italien). Iulia absolvierte eine Konzerttournee durch Süditalien und spielte in namhaften New Yorker Konzertsälen wie Greenfield Hall, the Harvard Club, St.Paul’s Chapel at Columbia University und Weill Hall at Carnegie Hall. 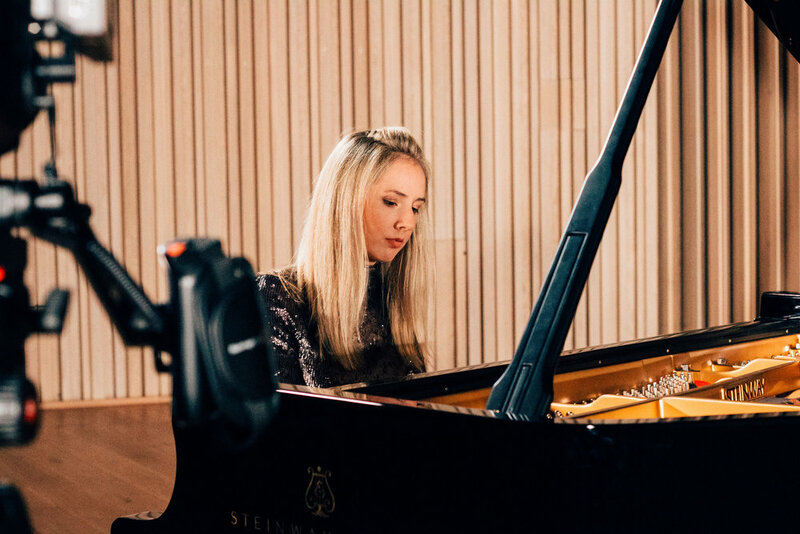 In 2015 war Iulia Teilnehmer an der Hamamatsu Klavier Akademie Japan. Weitere Leistungen wurden in Konzertsälen wie Bukarest Philharmonie, St. Martin in the Fields London, Act City Hamamatsu Saal, Museo Diocesano Brescia oder Arlberg 1800 Konzert Saal aufgeführt. Ihre hauptsächlichen Wettbewerbspreise sind der 1. Preis des 8. Internationalen Mozart-Wettbewerbs Rumänien, der 2. Preis beim Internationalen 'Sofia Cosma’ - Wettbewerb in Arad, 2. Preis beim Eisenberg-Fried Concerto Wettbewerb New York, je eine Silber- und Bronzemedaille beim World Piano Competition in Cincinnati, USA und die Piano Fischer, Bergen Grand Piano Academy und Chance Festival Preise des Klavierpodium Munchen Wettbewerbs. Iulia nahm teil bei Meisterklassen mit Antonio Pompa-Baldi, Bernd Goetzke, Boris Petrushansky, Hiroko Nakamura und Vladimir Tropp. Iulia absolvierte ihr Bachelor-Studium an der Manhattan School of Music New York, wo sie unterstützend das Artur-Balsam-Stipendium erhielt. In 2018 absolvierte die Pianistin ihr Master-Studium an der Hochschule für Musik, Theater und Medien Hannover bei Prof. Roland Krüger. 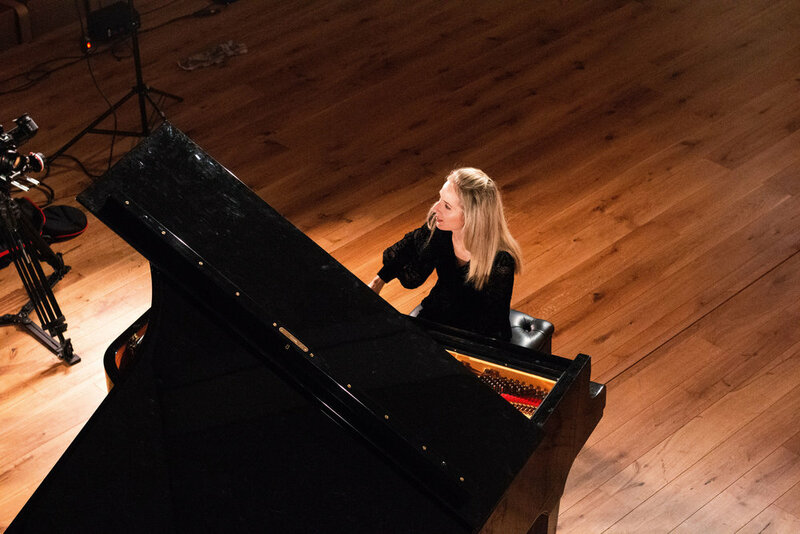 Already in 2018, the Romanian pianist Iulia Maria Marin was invited by the German-American Institute to perform at the Heidelberger Klavierwoche, where she left some strong impressions behind, especially in Liszt works. It was therefore only natural that she would return this year at the DAI with more works by her favourite composer - now incidentally as a newly graduated master student from the class of Roland Krüger at the Musikhochschule Hannover. Once again, we could experience an outstandingly intelligent Liszt virtuoso, who always remained committed to the great poetic idea of the piece, midst all the keyboard bravoura. This is how, in the pre-impressionistic jewel "Les jeux d'eaux à la Villa d'Este", as well as in the ballad-like Schubert paraphrase "Der Wanderer”, Melos and colours merged wonderfully eloquently. First-class format display was certain in Marin's electrifying performance of the B-minor Sonata, in which dramatic fury and lyrical ecstasy found the most harmonious balance. This famous organic-sounding half-an-hour long work alone, would have made the concert visit worth it. The young pianist mastered the big stylistic leap perplexingly sovereign after the intermission, from Liszt to Brahms and his four Ballads op. 10, whose lied-intimate features came out particularly well. One would have wished for more of Marin's witty Debussy play than just the two Preludes "Les fees sont d 'exquises danseuses" and "La Puerta del Vino”. As a program-crowning farewell, Aaron Copland's dance potpourri "El Salon Mexico" (1936) in the catchy piano version of his friend Leonard Bernstein was provided. Marin's fiery temperament made one almost forget of the naturally missing orchestral colours. The particularly original encore which was enthusiastically received by the DAI public: George Enescu's finely embellished Pavane from the four-movement D-Major Suite op. 10 of 1903. The splendid music of her compatriot should become Marin's heart mission. This pianist is a born Enescu interpreter. Sandershausen. The piano recital by Iulia Maria Marin on Saturday in Sandershausen began lyrically, almost thoughtfully. 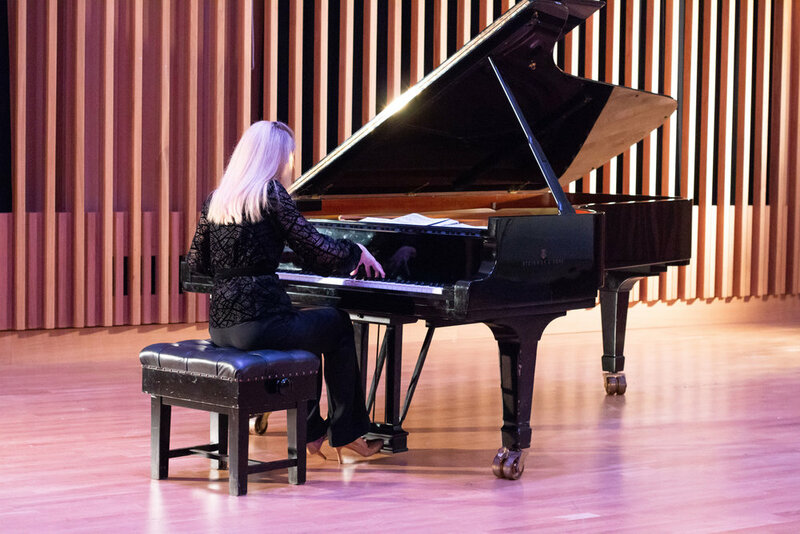 At the beginning of her recital, the Romanian pianist played a sonorous sonata by Baroque composer Domenico Scarlatti, which was juxtaposed with a sparkling sister piece. A mixture of singing-like narration and dexterity ran like a red thread through the stylistically diversified evening of the young pianist, who is currently studying at the Musikhochschule in Hanover. In Joseph Haydn's Es-Dur Sonata, composed for Marianne von Genzinger, Marin created a deep background in the slow middle movement, while the bright final Rondo sounded maybe a tad too silly. An introverted, rhapsodic sound world emerged in Johannes Brahms' Intermezzo op. 117 no. 2, dreamy and yet crystal clear. Three Preludes by Claude Debussy revealed another world of blurred, mysterious sounds, sparkling highlights and blocky chords which culminated in the formidable keyboard-wide spell of the well-known "Feux d'artifice". For others, the stamina might have been over, but the dainty 25-year-old added something else: after the intermission she offered a selection of the Etudes d'execution Transcendante by Franz Liszt, which is one of the most technically difficult of all that romantic piano literature has to offer. Despite all the grandeur and effervescence of the works, Marin often emphasised the narrative moment here too, creating large, spun lines. For the applause of the approximately 120 impressed listeners she thanked with another Brahms Intermezzo. "Shook the auditorium with tremendous dynamism"
[...] As a special musical experience was the pianist Iulia Maria Marin. The young musician has attracted attention in competitions through top rankings in recent years and now plays concerts with many renowned orchestras worldwide. What Julia Maria Marin offered the guests exceeded expectations. Her soulful playing on the EternalArts grand piano made one feel delicacy and sometimes it shook the auditorium with tremendous dynamism. Overwhelming was the sonority that the artist enthralled in the new premises of EternalArts, wonderful, with bravura and with incredible energy. Franz Liszt's difficult-to-play works, such as his Mazeppa as the last piece, Ms. Marin interpreted with power and flow, so that it held the breath of the guests and moved them to thank the artist with long applause. Dr. Schwäbe promised that this would not be the only appearance of Iulia Maria Marin in his showroom. The tenor Vlad Robu, who graduated the "Rodolfo Celletti" Accademia del Belcanto and the Danish Royal Academy of Music, held a recital last night in the Small Hall of the Romanian Athenaeum, together with the pianist Iulia Marin. The presence of the two performers was appreciated by the public, their collaboration being at a high level. It is clear that the experience of a different cultural context than the Romanian one helped the two musicians. [...] Considering her technical abilities, endurance and expressiveness, the pianist's value is undeniable. [...] Iulia Marin continued with a sensitive Mozart in a well-chosen tempo, finely celebrated, before she offered the stormy, often explosively effervescent Prokofiev with sparkling disharmonies in astounding dynamics.